Sustainability is commonly defined as “the degree to which an innovation continues to be used after initial efforts to secure adoption is completed”. It is important to acknowledge that assessing sustainability warrants a more sophisticated approach than does the longitudinal follow-up of intervention implementation. Elements of sustainability that researchers are beginning to address include system readiness for integration. Glasgow outlines the need for research that tests approaches to scaling up and sustaining effective interventions by focusing on five core values: rigour and relevance, efficiency, collaboration, improved capacity, and cumulative knowledge. What sustainability models are available to inform knowledge translation? There are an increasing number of models specifically focused on sustainability, but to date, few rigourous evaluations of these models have been conducted to assess their ability to predict actual implementation sustainability and sustainability of the outcomes. One well-developed sustainability model is the NHS Sustainability Model, which provides a structured diagnostic questionnaire and a weighted scoring system. This model revolves around three core elements of process, staff, and organization. 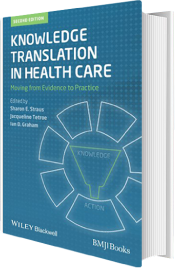 Factors in the process domain are benefits beyond helping patients; credibility of evidence; adaptability; and monitoring progress. For the staff domain, factors are training and involvement; behaviours; senior leadership engagement and support; and clinical leadership engagement and support. Finally, for the organization domain, factors are fit with goals and the culture and infrastructure. How can sustainability-oriented action plans be developed? Tension exists between the routinization of one idea and the receptivity to a subsequent good idea. Sustainability is not always a desirable outcome when the decision to modify or cease an innovation is evident. As research results and subsequent innovations are continuously being produced, sustainability strategies need to allow for the integration of new insights emerging from the production and application of new research knowledge. How should KT interventions be scaled up and spread? Two closely related concepts in the sustainability literature are spread and scaling up. In 1995, Rogers described spread as a less intentional or formal process through which innovations are adopted. Scaling up implies a much more deliberate “push” approach to change and refers to a “systematic programme to bring effective treatment, diagnosis or care approaches to wider populations, or to improve in other ways disease and programme specific services”. Scaling up takes knowledge translation beyond the realm of individuals and organizations that are early adopters. This requires concerted efforts to normalize evidence-informed approaches and to create the system structures that will recognize, support and reward these approaches. As is the case for sustainability, scaling up considerations should be considered early in the process; indeed, KT interventions should not be undertaken without consideration of sustainability. Conditions that are critical for scaling up include adequate human capacity; and supportive financial, organizational, governance and regulatory structures. What models exist for spreading and scaling up KT strategies? The science of spread is discussed in American NIH and AHRQ reports. A position paper prepared for the New Zealand Ministry of Health describes an action plan for the spread of proven health innovations. How should KT interventions be adapted and sustained? Perhaps the most intriguing issue underlying sustainability is the nature of the complex adaptive systems into which innovations are placed. This makes sustainability inherently difficult to predict and also tells us that sustainability ultimately comes down to adaptability of both the innovation and the system. Complex adaptive systems theory explains how dynamic and ongoing changes at one level of the system may eventually influence changes at another system level. Thus, even when an innovation is introduced at one system level, it invariably has the potential to impact or to be influenced by factors at the same and other system levels. Monitoring systems and data feedback mechanisms are needed to determine relevant process and outcome factors to assess sustainability. While some relapse or reversion to previous practices is to be expected, a decision will be necessary to determine how much relapse is acceptable to claim that sustainability is achieved. Sustainability assessment is not an all or nothing phenomenon.